A single event, in our lives, can make us question everything, changing beliefs we thought were permanent and moving the future towards a drastically different direction. The main character in Jonathan Papernick’s The Book of Stone, Matthew Stone, deals with precisely such a life changing event, which makes him question everything. Walter Stone, Matthew’s father and a well-known judge, passes away and leaves his son haunted by his father’s unmet expectations. While Walter Stone was alive, Matthew rebelled against everything he stood for, but after his death, Matthew changes significantly, trying to emulate everything his father was. In his effort to become more like Walter, Matthew starts interacting with his father’s associates who introduce him to new ideas about what it means to be Jewish. 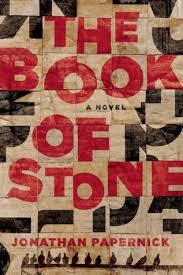 Although The Book of Stone is a work of fiction, Papernick fully immerses the reader into the book’s reality. As characters in the book consider important questions of morality and existence, the reader is also asked to consider the same questions. The Book of Stone is expertly crafted and creates a convincing plot sure to leave readers on the edge of their seats. Papernick’s use of imagery, language, and flashbacks helps to create an ever engaging reading experience. Wonderfully weaved throughout the book, well-researched historical references give the reader greater insight into Jewish history, the Holocaust, and the Israeli-Palestinian conflict. Jonathan Papernick is the author of two short-story collections, including The Ascent of Eli Israel and There Is No Other. He is the writer-in-residence at Emerson College. The Book of Stone is published by Fig Tree Books and will be available for sale on 5/12/2015. Posted on April 5, 2015 by Writer. This entry was posted in Book Review and tagged Book Review, Brooklyn Setting, Jonathan Papernick, Peace, Political Fiction. Bookmark the permalink.